The discovery of a mechanism that leads to cancer-therapy resistance highlights the many ways that tumour cells can adapt to survive — and reveals the limitations of categorizing patients by their gene mutations. Katharina Schlacher is in the Department of Cancer Biology, University of Texas MD Anderson Cancer Center, Houston, Texas 77058, USA. The development of resistance to cancer therapy is a major predictor of patient mortality. Therefore, understanding resistance mechanisms is key to improving therapeutic outcomes. 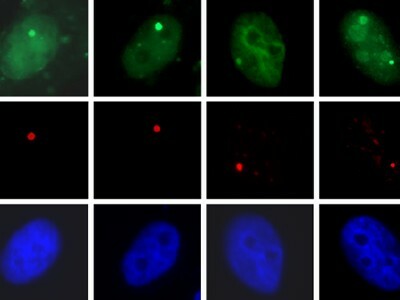 Writing in Nature, He et al.1 report their discovery of a resistance mechanism in ovarian-cancer cells that contain a mutant version of the BRCA1 gene. Mutations in BRCA1 and BRCA2 genes can cause breast and ovarian cancer by inactivating either of two major biological pathways that ensure genome stability. One of the pathways repairs DNA double-strand breaks through a process called homologous recombination2 (HR). The other process is called fork protection3,4, and safeguards newly synthesized DNA at structures called stalled forks that arise during DNA replication. In HR repair, an essential bottleneck step is the processing (resection) of double-strand breaks by nuclease enzymes to produce single-stranded (ss) DNA. BRCA1 acts as a key regulator protein that coordinates the recruitment of the nucleases, which include the MRE11–RAD50–NBS1 protein complex. BRCA1 also has a second role in HR repair: it recruits BRCA2, which in turn loads the RAD51 protein onto the ssDNA. RAD51 then assists in the binding of the ssDNA to a complementary strand that serves as a template for error-free repair. Cancer cells that have certain BRCA1 or BRCA2 mutations cannot repair double-strand breaks caused by anticancer drugs currently used in the clinic, and so die when treated. Such drugs include cisplatin and PARP inhibitors (PARPi, drugs that specifically target BRCA-mutant tumours by taking advantage of their break-repair defects5). However, cancer cells can acquire strategies to circumvent the drugs’ actions, causing resistance and limiting the use of these initially effective drugs. In their rigorous study, He et al. used a gene-editing screening method6 to identify resistance mechanisms in BRCA1-mutant ovarian-cancer cells. A known resistance pathway in both BRCA1-mutant and BRCA2-mutant cells is the restoration of BRCA function by re-mutating the original BRCA mutation (see ref. 7, for example; Fig. 1a). A second mechanism is drug avoidance, in which a membrane protein pumps the drug out of the cell or reduces its uptake8. He and colleagues’ screen correctly identified a membrane protein implicated in the uptake of cisplatin by tumour cells as a contributor to resistance, verifying the suitability of the authors’ approach. Figure 1 | Mechanisms of drug resistance in cancer cells that contain BRCA mutations. Many cancer cells have mutations in the BRCA1 or BRCA2 genes. These mutations inactivate a DNA-repair pathway that involves a process called homologous recombination (HR), or a process known as fork protection that is involved in DNA replication. 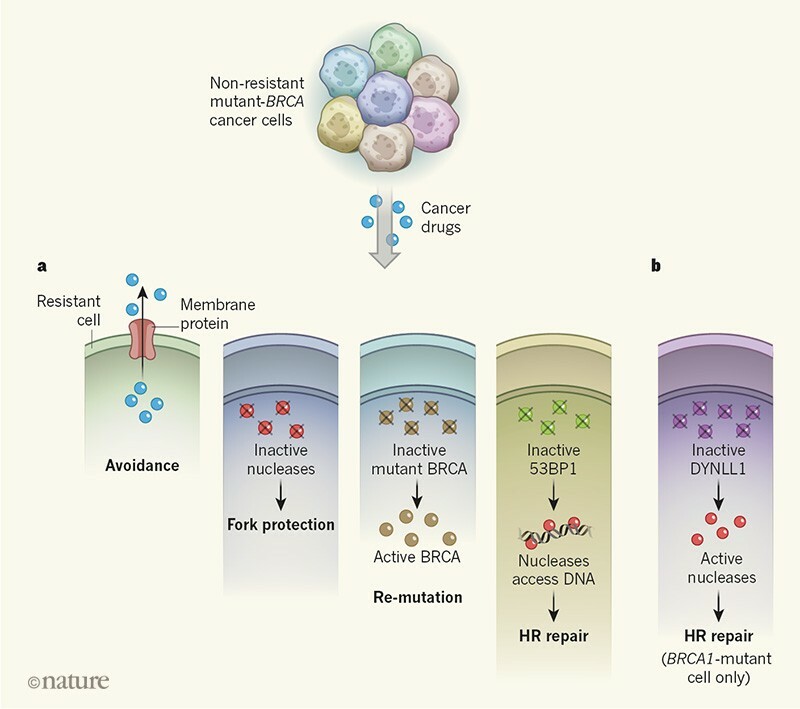 a, BRCA-mutated cancer cells have developed many different paths to resist being killed by cancer drugs, including: drug avoidance by pumping drugs out of the cell through a membrane protein; restoration of fork protection by inactivating nuclease enzymes; re-mutating the original BRCA mutation to restore the functions of the BRCA proteins; and restoration of HR repair, for example by inactivating the 53BP1 protein in BRCA1-mutant cells to allow nucleases to access DNA. Here, the resistant cells are derived from non-resistant cells of the same colour. b, He et al.1 report that in BRCA1-mutant cells, but not in BRCA2-mutant cancer cells, inactivation of the DYNLL1 protein activates nucleases and thus restores HR repair. Importantly, one of the top gene ‘hits’ identified by the screen as causing resistance to both cisplatin and PARPi was DYNLL1. The DYNLL1 protein acts in many cellular processes9, including intracellular transport and motility, and also inhibits the enzyme nitric oxide synthase (which produces the cell-signalling molecule nitric oxide), but had not been previously implicated in cancer-drug resistance. Deciphering how its inactivation leads to resistance therefore seemed a daunting task. The authors robustly established that DYNLL1 acts as a negative protein regulator of DNA-end-processing nucleases — it directly interacts with MRE11 and thereby keeps its nuclease activity in check. Inactivation of DYNLL1, therefore, unleashes the nuclease activity of MRE11, even when BRCA1 is not there to help guide it to breaks, and so restores the first of the two HR-repair functions normally carried out by BRCA1 (Fig. 1b). Conceptually, drug resistance associated with DYNLL1 inactivation is analogous to that caused by inactivation of 53BP1 — another protein that inhibits DNA-end resection, in this case by blocking the access of nucleases to DNA. Inactivation of 53BP1 has been reported to restore resection and therefore resistance in BRCA1-mutant cells, but not in BRCA2-mutant cells10,11. Moreover, DYNLL1 is known12 to interact with 53BP1. Yet, unexpectedly, He et al. show that resistance associated with DYNLL1 inactivation does not occur through loss of the 53BP1–DYNLL1 interaction. He and colleagues’ study highlights the intricacy of distinct gene functions in cancer-drug resistance, and the importance of defining biological mechanisms and activities to predict whether tumour cells will be killed. In this case, DYNLL1 inactivation reactivates resection, which is ablated in BRCA1-mutant cells, but not in BRCA2-mutant tumour cells. DYNLL1 inactivation, therefore, results in resistance in BRCA1-mutant cells, but not in BRCA2-mutant cells. Another resistance mechanism that separates BRCA1 and BRCA2 functions has been reported in BRCA2-mutant ovarian-cancer cells13, where inhibition of the EZH2 enzyme reduces the recruitment of the MUS81 nuclease to replication forks. Notably, this does not restore HR repair, but instead restores fork protection and the survival of BRCA2-mutant cells, and not of BRCA1-mutant cells. By contrast, EZH2 inhibition increases the sensitivity of BRCA1-mutant breast cancers to PARPi14. Yet restoration of fork protection by inhibition of MRE11 results in resistance to PARPi and cisplatin in both BRCA1- and BRCA2-mutant cells, even when HR repair remains defective15. Thus, it is tempting to suggest that tumour-cell heterogeneity16 — the existence of tumour-cell subtypes that stem from the same mutation, but which have mutated further to form distinct subpopulations — could partly arise as a result of cells making individual ‘decisions’ about which survival mechanisms to use, including HR repair, fork protection or both. Although BRCA1 promotes resection during HR repair, it can also prevent the degradation of newly synthesized DNA by nucleases during fork protection, through an unknown mechanism. These dual, and seemingly opposing, modes of action raise the possibility that restoration of HR repair could promote tumour-cell survival even when fork protection is dysfunctional. Similarly, DYNLL1 inactivation might in fact cause defects in fork protection by promoting excessive MRE11 activity at replication forks, irrespective of BRCA mutations. Future studies will be crucial to dissect the apparently opposing nuclease processes at breaks and forks, and their effects on tumour-cell survival, as a possible nexus point for therapeutic intervention. The emergence of diverse mechanisms for cancer-drug resistance demonstrates that cancer cells respond distinctively to individual defects of molecular function — rather than to an overall genetic defect — to rebalance the cellular homeostasis that ensures their survival. He et al. identified DYNLL1 inactivation as a resistance mechanism to cisplatin and PARPi; although both drugs cause double-strand breaks, their mode of action differs. In addition, other commonly used anticancer drugs, including gemcitabine, 5-fluorouracil and hydroxyurea, mainly disrupt replication reactions. Researchers, therefore, should expect to identify many different ways in which resistance can develop. These roads to resistance might require the restoration of replication processes, repair processes or both. The sequential use of different cancer therapies when an initial treatment is not successful is routine practice, but could lead to the development of multiple resistance mechanisms, and ultimately to resistance to any of the therapies. People with cancer who have BRCA1 and BRCA2 mutations are currently grouped together in many genome studies and when considering treatment options, despite increased understanding of the molecular and genetic distinctions. He and co-workers’ study suggests that molecular function, rather than genotype function — in this case, the specific role of BRCA1 in resection, rather than its overall role in HR repair or in fork protection — dictates the cellular outcomes. More broadly, these results suggest that personalized-medicine strategies should be considered that take into account molecular functions in individuals, rather than categorizing people solely by genotype. He, Y. J. et al. Nature https://doi.org/10.1038/s41586-018-0670-5 (2018). Moynahan, M. E. & Jasin, M. Nature Rev. Mol. Cell Biol. 11, 196–207 (2010). Schlacher, K. et al. Cell 145, 529–542 (2011). Schlacher, K., Wu, H. & Jasin, M. Cancer Cell 22, 106–116 (2012). Bryant, H. E. et al. Nature 434, 913–917 (2005). Shalem, O. et al. Science 343, 84–87 (2014). Sakai, W. et al. Cancer Res. 69, 6381–6386 (2009). Goldstein, L. J. et al. J. Natl Cancer Inst. 81, 116–124 (1989). Barbar, E. Biochemistry 47, 503–508 (2008). Bunting, S. F. et al. Cell 141, 243–254 (2010). Bouwman, P. et al. Nature Struct. Mol. Biol. 17, 688–695 (2010). Lo, K. W. et al. J. Biol. Chem. 280, 8172–8179 (2005). Rondinelli, B. et al. Nature Cell Biol. 19, 1371–1378 (2017). Yamaguchi, H. et al. Oncogene 37, 208–217 (2018). Ray Chaudhuri, A. et al. Nature 535, 382–387 (2016). Sottoriva, A. et al. Nature Genet. 47, 209–216 (2015).